Few trolls choose to practice this sort of magic. Ice trolls give up their fire spells and use their magical talent to keep their inner cold alive, which they can breathe at their enemies to let them shudder in frost, making them almost unable to move. 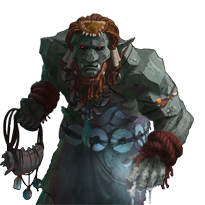 Their low body temperature also allows ice trolls to spend more energy in order to move faster than most other trolls. Special Notes: This unit regenerates, which allows it to heal as though always stationed in a village. This unit is able to slow its enemies, halving their movement speed and attack damage until they end a turn.